I had to find a way to put two of my favorite things together, paper mache and used glass jars. I always have liked the shape of salad dressing bottles, but they invariably look like salad dressing bottles. However, the other day, I had an idea. I wasn’t exactly sure where it would go (if you follow my blog at all, I think that might sound a little familiar to you!) but I thought I would just go with it and see where it led. It was a little more time consuming than I had expected, because it took a LOT longer to dry than I thought it would, but I am REALLY pleased with the result AND I can see other possibilities. I’m sure I’m not the first to do something like this, but, so what? Maybe someone reading this hasn’t thought of it either. 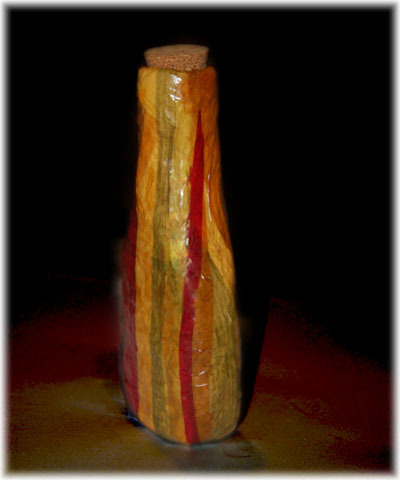 So, let’s go on over to Make It and you can also make your own Paper Mache Bottle. You never know where you go but finally it’s always great ! Love your bottle, such an imagination you have !!!!! Creativity is always in respect! Especially if it takes to the satisfaction result. Good luck!